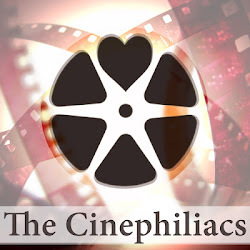 Starring: (the voices of) Kelly MacDonald, Emma Thompson, Billy Connolly, and Julie Walters. For all its fantastic characters, inventive narratives, and ability to make me open tear ducts I wasn’t even aware I had, the most impressive part of the Pixar brand today for me is its seamless ability to truly design visual storytelling. No longer can we watch animation without thinking of the shot structure, editing patterns, and mise-en-scene like the ways we consider in films made without the aid of computers (which, of course, is very few these days). Especially in Pixar’s Brave, their latest film, I found myself constantly tracking the “camera placement,” for something that wasn’t even there. Pixar has continually pushed the mold of what animation can mean, it certainly shows off the company’s ability to use animation not as an end but as a medium, even if Brave isn’t as “groundbreaking” as the company’s previous entries. It’s tough when you are Pixar—so many of their films have literally pushed the bar, that when something as solid and well crafted as Brave comes along, the gut reaction is to attack it for not being the equivalent of the Sistine Chapel. What does come up slightly disappointing is that Brave, which has been highly publicized as the first Pixar film to feature a female protagonist, is the film’s rough edges. 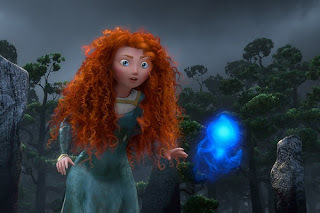 Brave might be less equivalent to Toy Story or Up than Tangled, the enchanting Disney film from a couple years ago. Although Brave is about a princess, it’s hardly a princess film is the Disney sense. 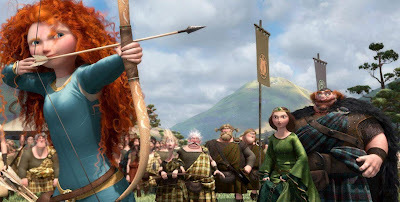 The film begins with the young Merida, a Scottish princess with flowing locks of curled red hair (simply stunning to watch how Pixar plays with this difficult feat throughout the film’s varied environments). After a brief prologue that establishes the relationship between her and her mother, Elinor, we catch up Merida as a princess torn between the life her mother wants for her (marriage) and the adventures she desires. Her weapon of choice is a bow (making this at least the fourth archery related film in the last year) and her main purpose is to defy her mother. Her father, all brawns and only a bit of brains (and haunted by a bear that took his leg), is of little help, as he trusts his wife with all his heart. So when by fate she has a chance to change her future, she takes a chance with unintended consequences that drastically place her and her mother on tense and desperate territory). 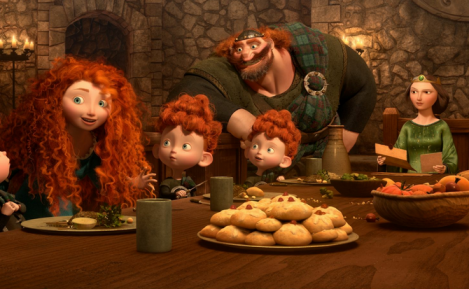 Brave originally started as a project from Brenda Chapman, who would have been Pixar’s first female director of one of her projects until she was replaced by Michael Andrews (while originally this seems like some Pixar boys club prejudice, more recent interviews have made her departure seem more than amicable). However, if there’s one thing that really works in Brave, it’s the complex emotions that define this mother-daughter story. Early in the film, Andrews cleverly parallel edits between the two as they argue with imaginary characters what they would actually like to say to each other, though neither is listening (physically and metaphorically). This isn’t just another princess who gets what she wants; in many ways, Elinor is just as much as a protagonist as Merida. The issues with Brave thus come less its core than the outliers around it, which simply aren’t up to the usual polish that the Pixar stamp usually suggests. 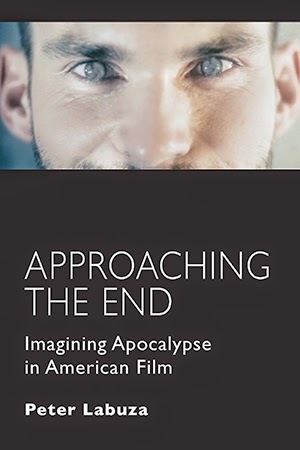 Just as the film seems to get going, I noticed we were already heading into third act territory, and the film's constant reliance on musical interludes felt it was hiding over a lack of inventive storytelling. Andrews and his screenwriting team seem a bit sloppy in piecing together their story, notably in the film’s odd, almost motionless second act. One of Pixar’s most famous qualities is the high amount of scrutiny that Pixar’s screenplays go through with their “brain trust,” but Brave’s screenplay feels often like a first draft—a late dialogue exchange (“You’ve changed!” “So have you.”) made me groan. And while there are a few inventive visuals, notably a group of blue, orb-like ghosts that feel like something from a Miyazaki dream, the film’s most major non-human character is a bit cartoonish in comparison to the film’s lifelike visuals that gorgeous bring together not only hair, but fog and waterfalls. Which is not to say that Brave doesn’t hit an emotional center, or have a good sense of humor (especially with Merida’s three younger brothers and their slapstick antics). Brave’s visual sensibilities to tell animated stories with the sense of a camera is impeccably better than the works of the company’s competitors, and the emotions and passion for this medieval tale are wholeheartedly apparent through most of the film. Plus, the fact that Pixar has crafted a female-driven narrative that actually speaks to females without talking down to them seems like a miracle in today’s take offense at anything culture. But Brave simply lacks polish, and had the company decided to push the project back another six months (sadly impossible in today’s age, especially considering Pixar is now officially owned by Disney), perhaps it could have been the best Pixar film yet. However, a “great time at the movies, despite its flaws” will have to do.